Guy Pellitteri of Pellitteri Property Services emphasizes the company wouldn’t be in business today without its two Walker Mowers. Pellitteri Property Services is not the biggest mowing contractor in the area. In fact, it’s a mom-and-pop operation, yet one that maintains some of the nicest properties along this stretch of Lake Ontario. Upward of 15 to 20 percent of their work comes from these summer/seasonal homes and another 60 percent from year-round residents. Commercial properties make up the rest, enough to keep the husband and wife team busy mowing five days a week, with one day left open for gardening or to adjust the schedule when it rains. Ironically, when they started in business in 1999, mowing lawns wasn’t their first choice. Guy wanted to manage properties. However, after a few customers asked them to maintain their lawns, the business model changed. They still provide property management services—closing and opening pools, turning irrigation on and off, and coordinating with electricians, plumbers and other contractors— for several large estates. During the winter months, they also continue to keep tabs on these properties, but mowing has long been the company staple. Summer/seasonal lake properties account for 15 to 20 percent of Pellitteri Property Services’ work. The Pellitteris admit that profitable growth didn’t come easy. “The first couple of years, we were working hard, taking any job that came our way, but we seemed to be going in circles,” says Guy. “Then I attended a seminar on pricing at Landscape Ontario and came home with some ideas that helped tremendously. Most people, when they start in business, don’t have any idea how to price their service and we were the same way. If the mowing contractor down the street was charging $50 a lawn, that’s what we charged without knowing our actual costs. 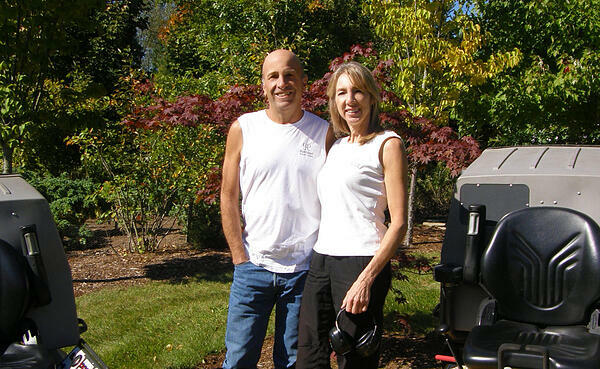 Guy and Diane Pellitteri, owners of Pellitteri Property Services, admit that profitable growth didn’t come easy. Learning how to price jobs was a major obstacle to overcome initially. 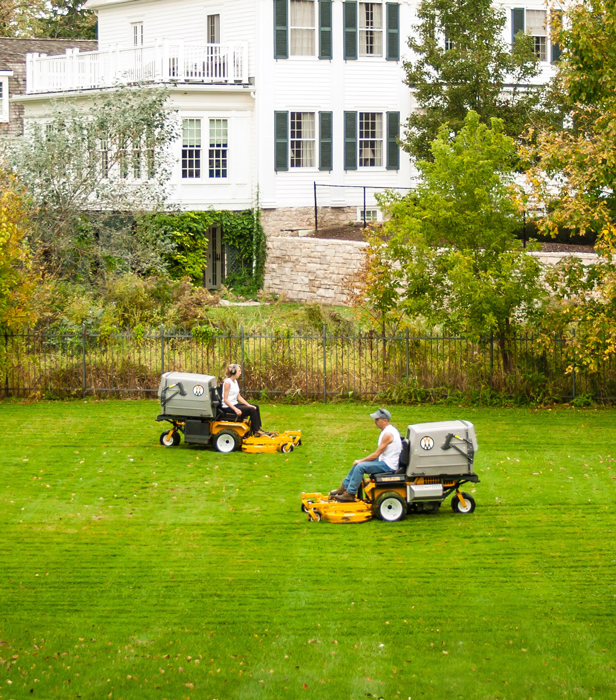 Pellitteri Property Services operates two Walker Mowers, both T25i’s with 48-inch GHS decks. Purchased from E & R Lawn Equipment in nearby Niagara Falls, each is equipped with the deckheight adjuster and an upgraded suspension seat. The mowers are kept for three years and then sold privately, usually to other contractors. “Guy is particular about his mowers,” relates Diane. “He detailed that first used one we purchased right down to replacing the Walker decals. He also does all the routine maintenance and most repairs, and from time to time, helps other landscapers with repairs and troubleshooting on their Walker Mowers. Guy Pellitteri isn’t the sole “particular” family member at Pellitteri Property Services. 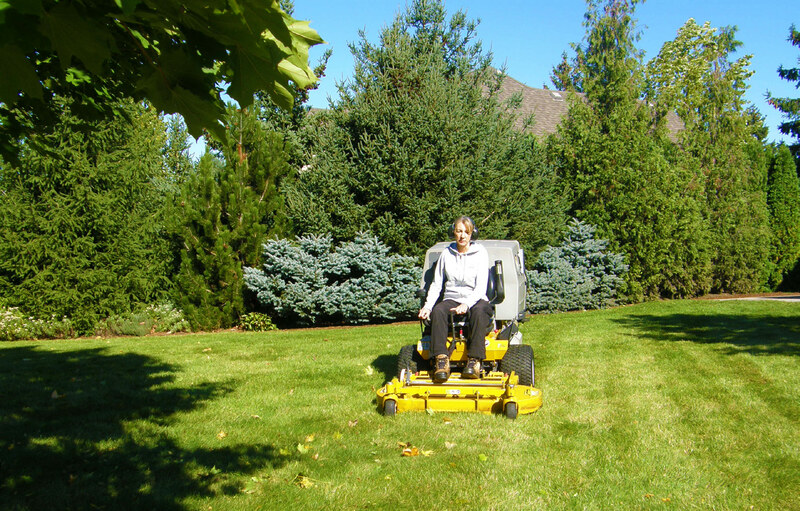 Diane is an excellent operator and prides herself in being even more careful than her husband when operating her Walker Mower. “In the off-season, he disassembles the mowers, replaces any needed parts, and meticulously cleans and details them. When the season begins, customers often compliment us on our ‘new’ machines.” Guy isn’t the sole “particular” family member. An excellent operator, Diane prides herself in being more careful than her husband. “I cringe when Guy bumps into something while loading his on the trailer. That would never happen to mine,” she laughs. In addition to mowing, Diane has traditionally done most of the gardening, although the couple shares much of that duty today. Again, mowing is the company staple. The average start date is the third week in April and the mowing goes through the end of October. The two Walker Mowers are then put through their paces for another month (or until the first snow, whichever comes first) for leaf cleanups. "The deck-height adjuster comes in real handy for leaves,” adds Guy. “On one machine, we set the deck at the highest level to quickly vacuum up the bulk of the leaves. Our second Walker follows up at a lower deck level for a manicured cut. The Pellitteris have good relationships with local mowing contractors, and from time to time, Guy helps them with repairs and troubleshooting. 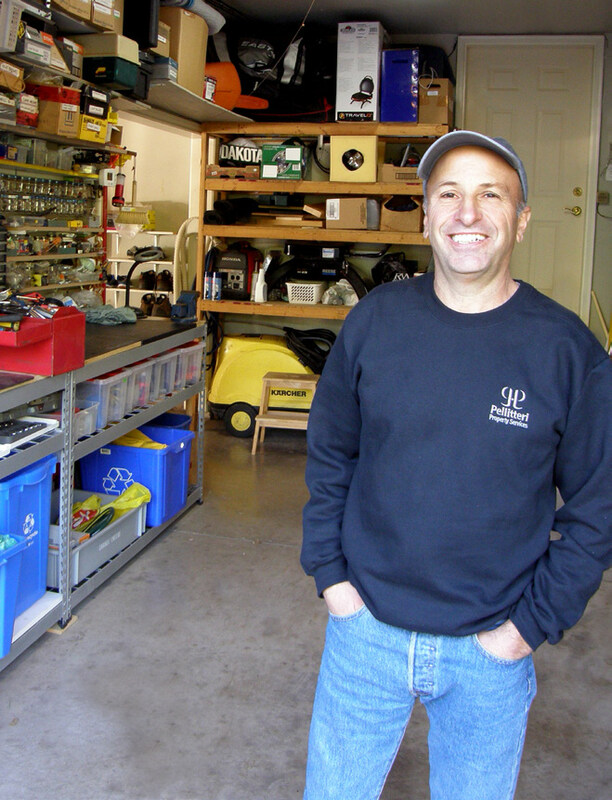 These business owners have found a comfortable niche and credit Walker Mowers for much of their success—to the extent that Guy emphasizes they wouldn’t be in business today without them. It’s all the more reason to keep those wheels turning.